Baluchi carpets (or Baluch or Beluchi carpets) are handmade carpets originally made by Baluch nomads, living near the borders of Iran, Pakistan and Afghanistan. About 70% live in the main part in Pakistan. Smaller groups of Baluch nomads also live in Bahrain, and in the Punjab and Sindh provinces of India. Today I bought this 100% wool Iranian one in the city of Sao Paulo in Brazil, bargaining for a good price in the time-honoured fashion. My friend in the literary cafe www.albericorodrigues.com.br said it was a good colour to have in an apartment, a “happy” colour. 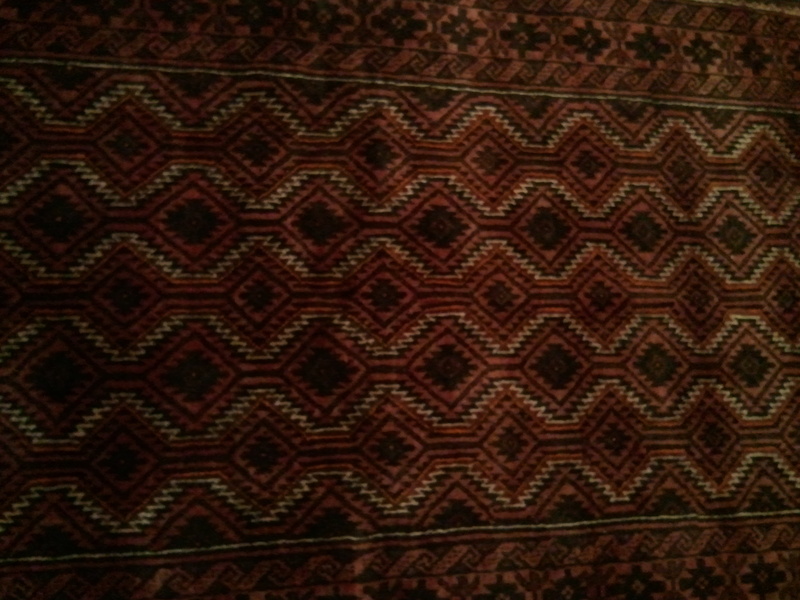 It’s more red than the photo shows, especially in natural light, and it had the thickest pile of the smaller carpets the dealers had on their stall at the Praca Benedicto Calixto market. And I guess I know something new about John Belushi too.